Gazing through a less-than-perfect old window, the glass stained by years, I spot locals rushing out over the narrow cobblestone street; occasionally, a group of tourists following their guide. 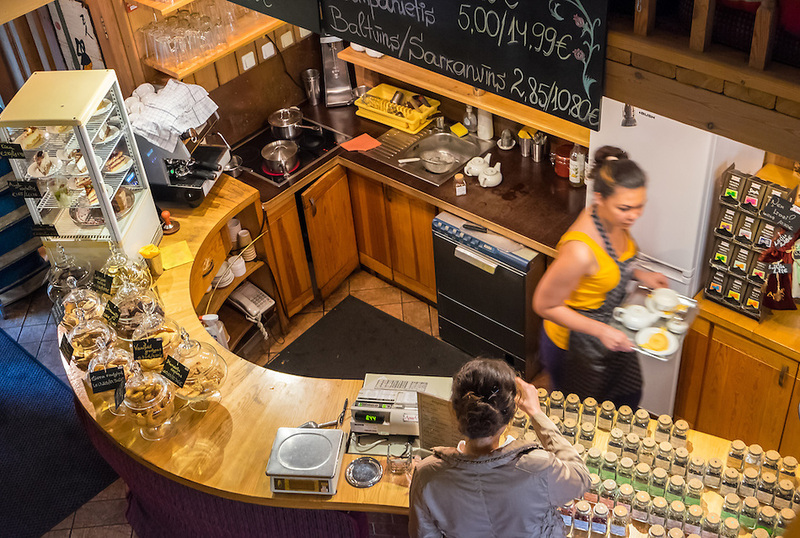 There is a pleasant feeling in the ambient, soft music, and the fresh smell of recently ground coffee accompanied by the almost-permanent whistle of the coffee machine. This is my last day of my week in Latvia and I am in the bar Riga Black Magic enjoying a Black Balsam, a traditional herbal liqueur that is made by mixing vodka with 24 medicinal herbs and plants, bitter in taste, but sweet and distinct. 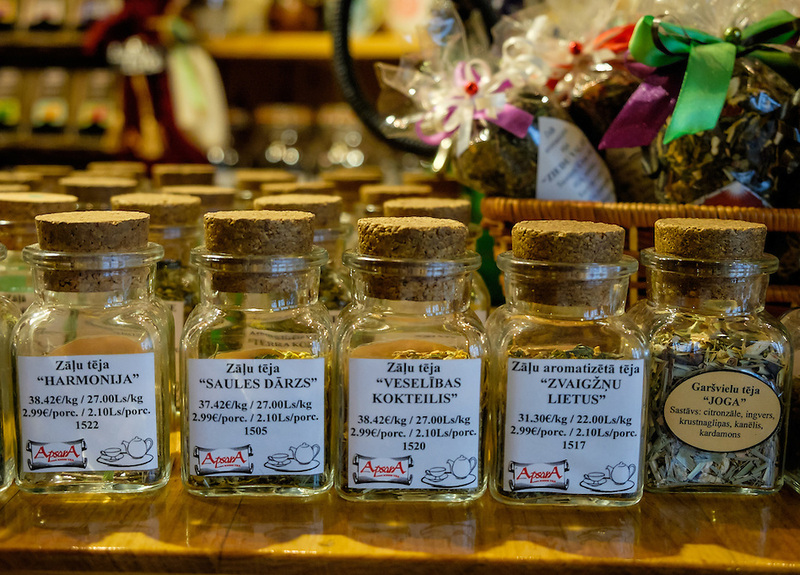 I am told that there is a very high probability that it is here, in the Riga Black Magic bar, where the pharmacist Abraham Kuntze created the first Riga Balsam in the laboratory situated in the basement in the 18th century. 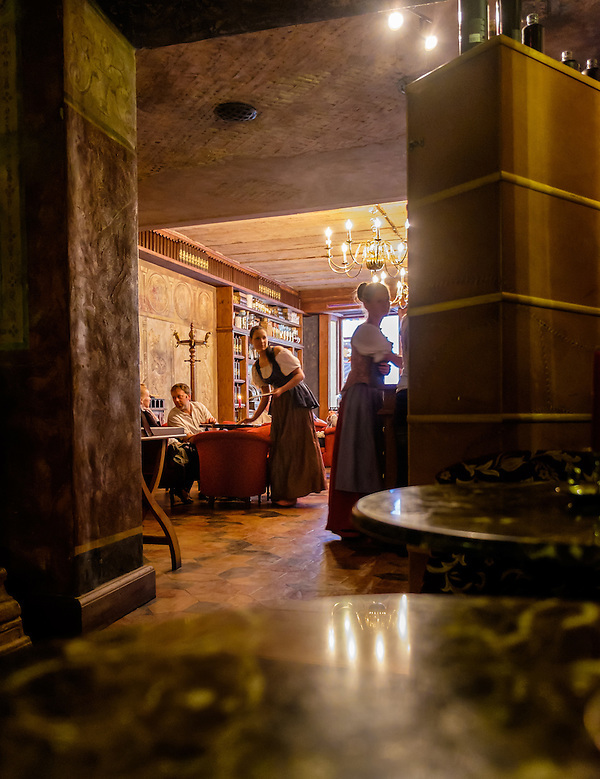 Like in most other parts of Old Town Riga, the place offers a journey back to the past. 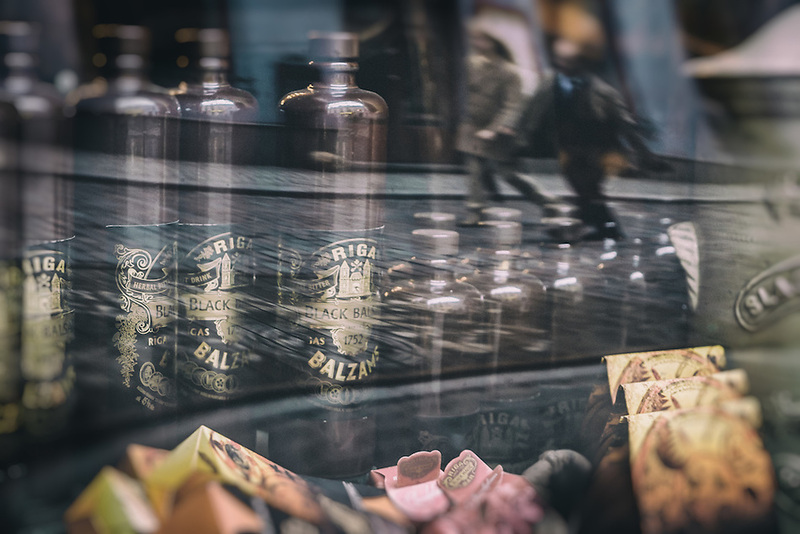 Window reflections of the famous Black Magic Riga bar in Old Town. 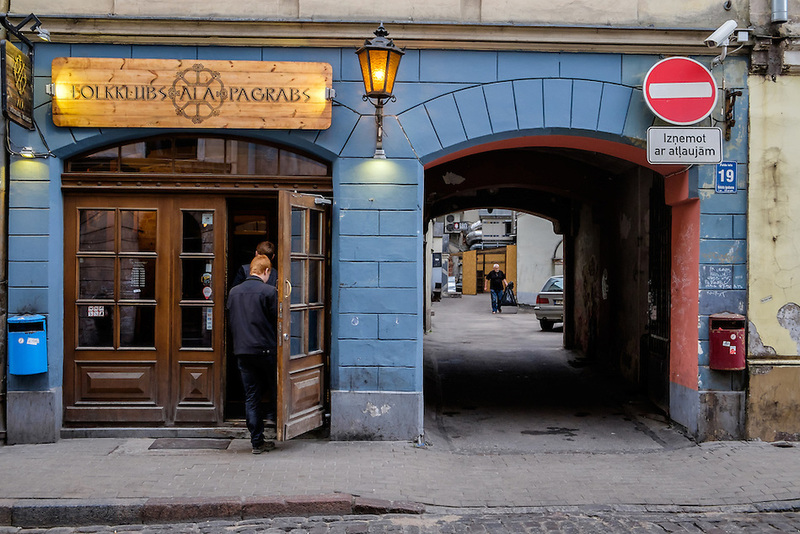 Interior view of the famous Black Magic Riga bar in Old Town. 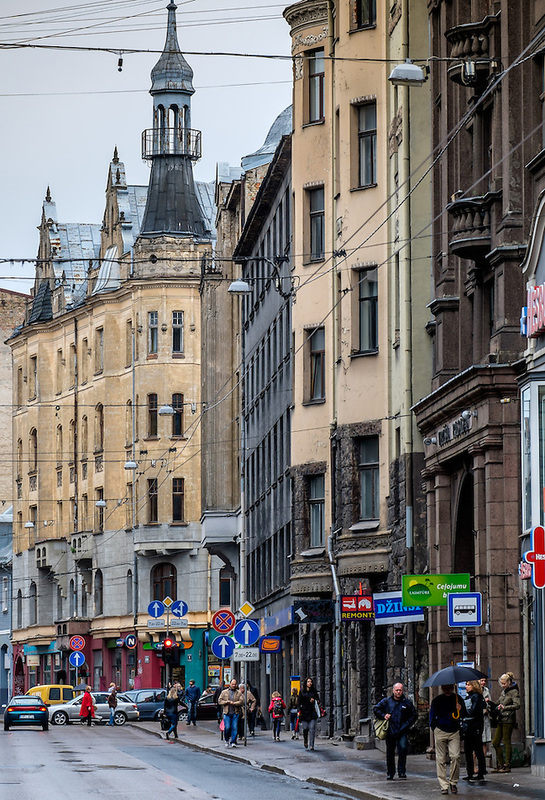 Riga manages to couple its diverse architecture with an almost fairy-tale reminiscence. 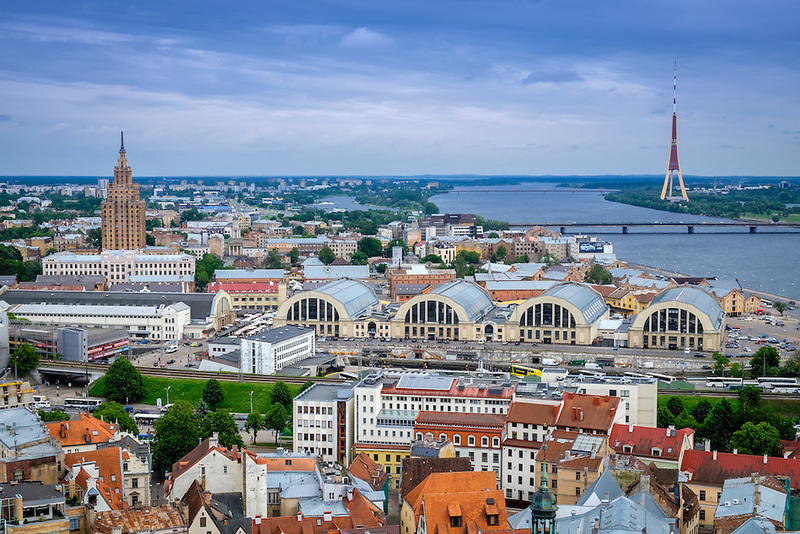 The capital of Latvia is also the largest city of the Baltic region. The historic center is a UNESCO World Heritage Site, and was also named 2014 European Capital of Culture. With such accolades, I needed to experience, photograph and explore it. I am glad I did. There is plenty to see and do here, including day trips to other parts of the country. I’ve also visited Sigulda, and the ancient city of Cesis; I’ll make a post later on these. Three stars rising high above in the sky was one of the first things I noticed:, The Freedom Monument, a symbol of the Latvian independence and Riga’s major landmark. It can be seen from almost anywhere, being located in the main street, right outside the Old Town. I loved my strolls there. I restlessly wandered the ancient cobblestone alleys, admiring steeples and turrets. I rambled the margins of the Daugava River, just there, before it drains in the Gulf of Riga after traveling over 600 miles from Russia, kissing Belarus and inner Latvia on its path. There is a special relationship between the city and art nouveau; in fact, over 40 percent of the buildings in the centre are constructed in this style. 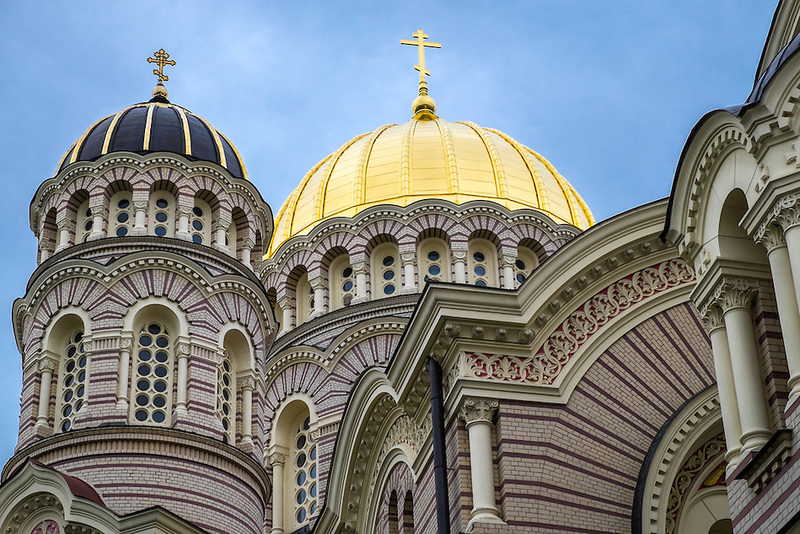 Characterized by its ornamental curved lines, asymmetrical rhythms and contours, the facades are pieces of art themselves, full of sculptures and stained ornamental glass. There is something to lay my eyes in every direction. 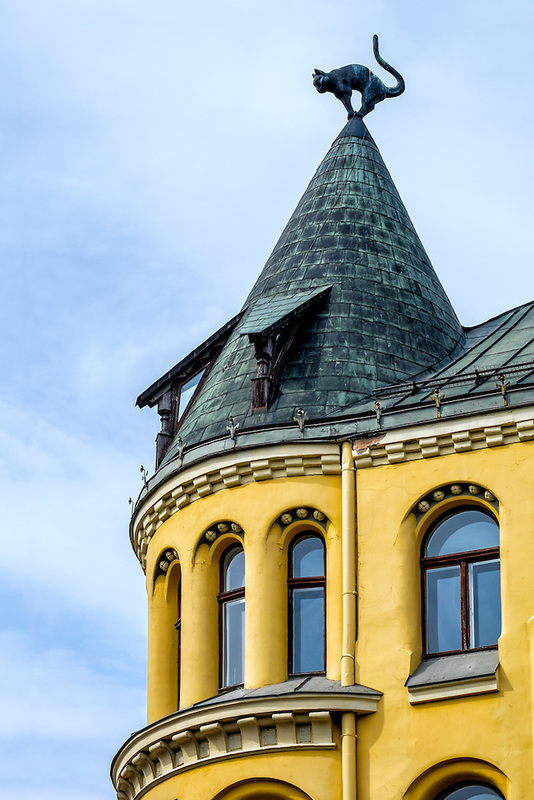 Up on the roof, an angry-looking cat with arched back seems about to jump from the building; this is the Cat House, one of the many landmarks in Old Town. I found myself enjoying and photographing buildings like this often during my walks. It was my moment to realize why, as put by the Latvian Tourism Development Agency, this is a place “best enjoyed slowly.” There is a story, a legend, something to discover in almost every corner, and I loved that. Having cloudy, rainy days most of the time didn’t stop me from making the most of it, taking photos of the iconic places and locals in the streets, bars and markets. In sum, to create photography that shows this fantastic city, customs and heritage at its best. 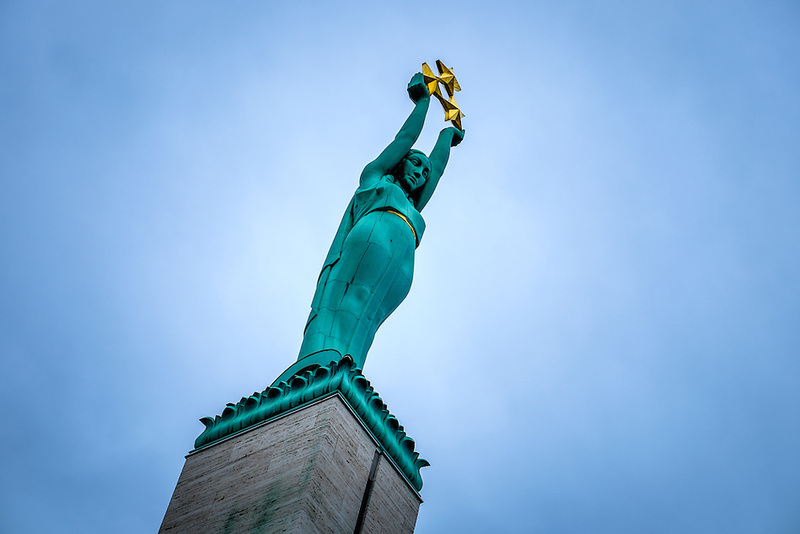 Detail of Sculpture of The Freedom Monument in Riga. 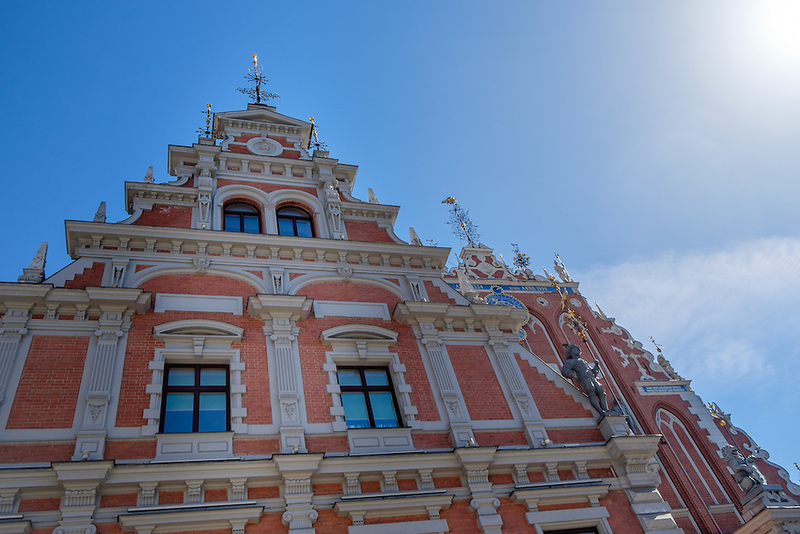 Architectural detail of “The House of Blackheads” in old town Riga. Bar in Old town Riga. People in the streets of Riga. 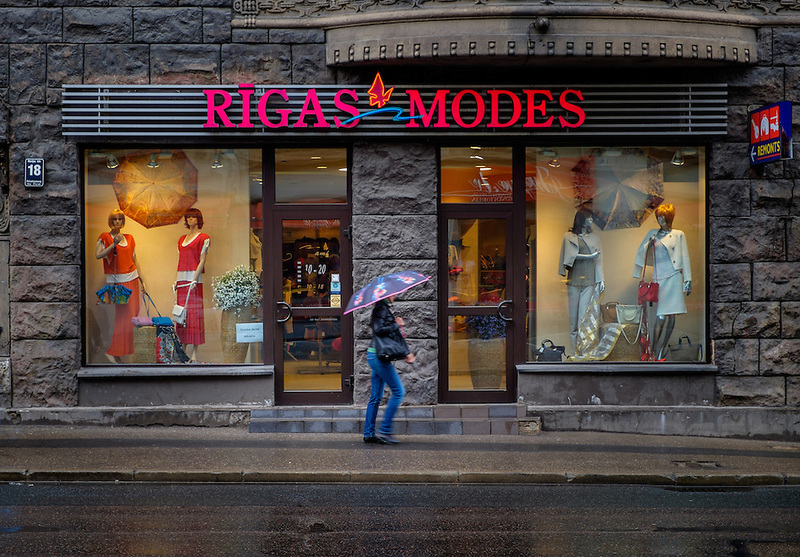 Typical storefront in Marijas iela street in the center of Riga. Detail of rooftop decoration at the Cat House building, a landmark in Riga. Architectural detail of The Nativity of Christ Cathedral in Riga. 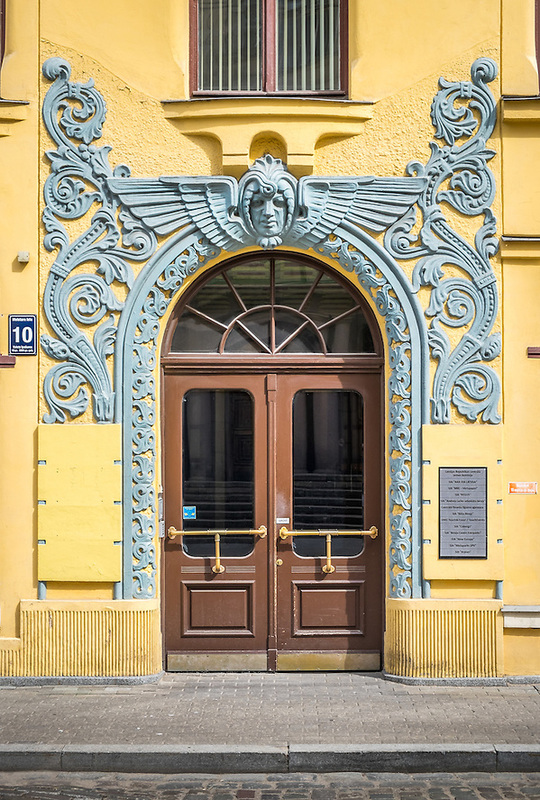 Detail of entrance decoration at the Cat House building, a landmark in Riga. 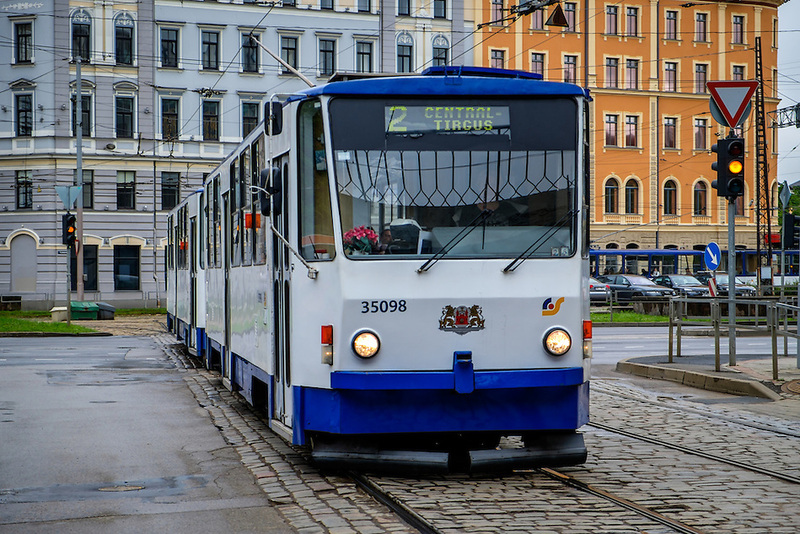 Tramway in the streets of Riga. 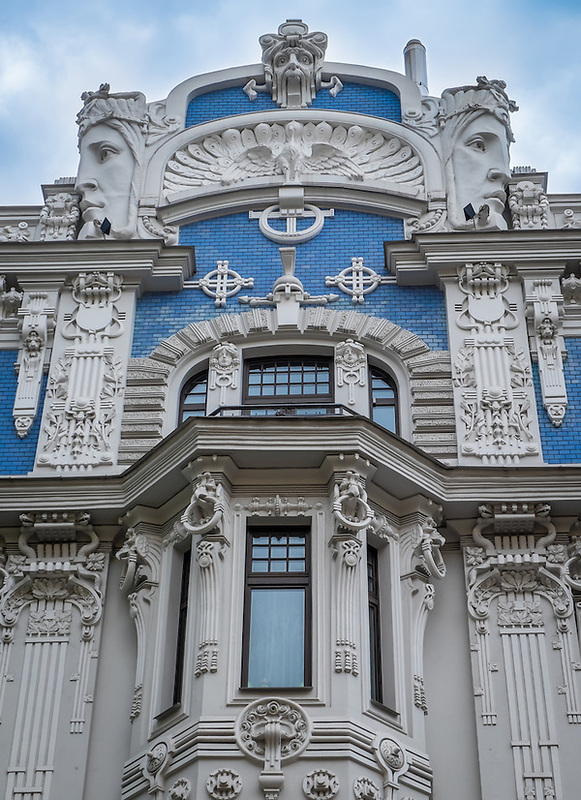 Architectural detail of typical Art Nouveau building in Riga. 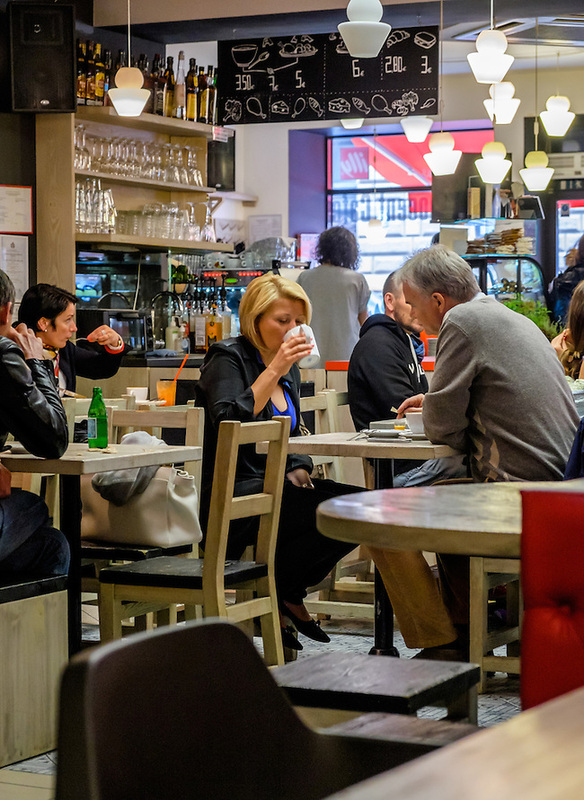 Interior view of the of the popular bar and Coffee Shop Innocent in Riga. Marijas iela street in the center of Riga. 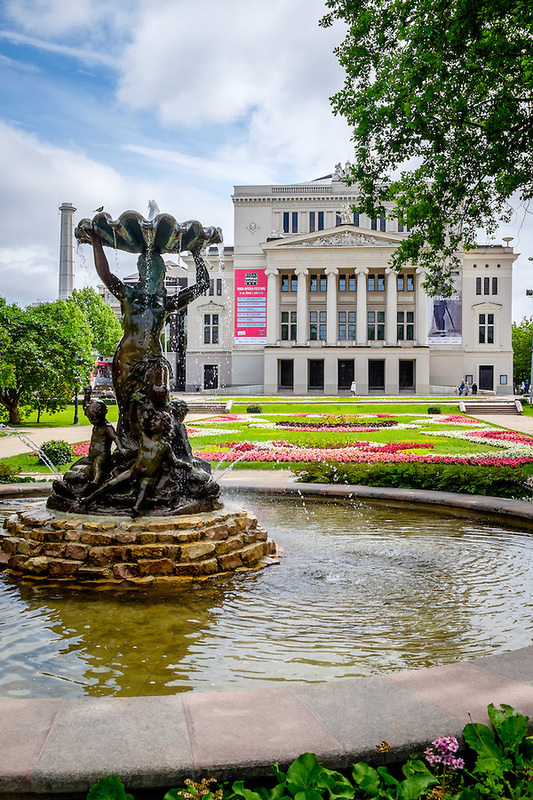 Riga is a green city, at least during this time of the year, and the town is full of perfectly manicured parks and gardens, canals and bridges that embellish the wonderful Bastion Hill park just outside city centre. 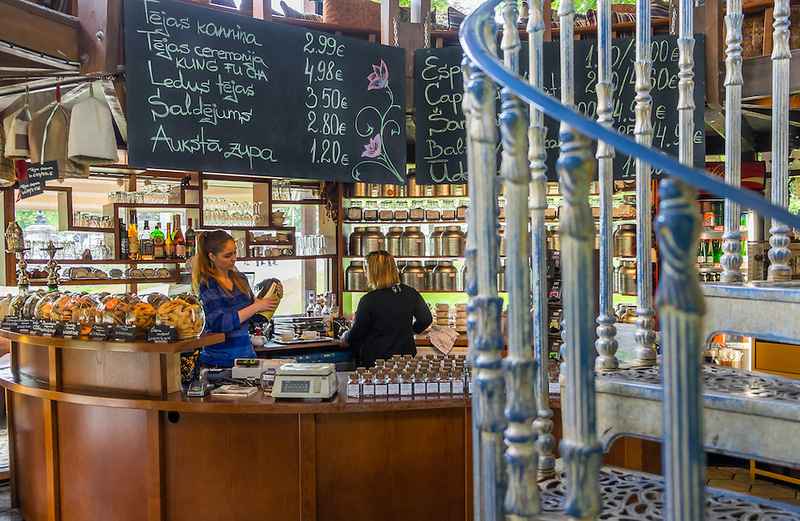 I especially like the wooden and glass tea houses; nested in the middle of the greenery, they offer a great selection of teas in a cozy ambience, ideal for winding down and recharging while glimpsing Riga’s daily life. 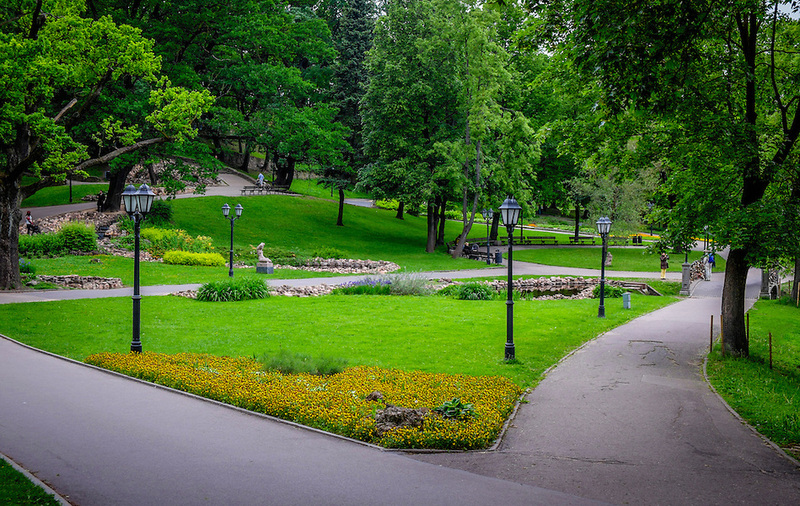 Bastion Hill Park in Riga. 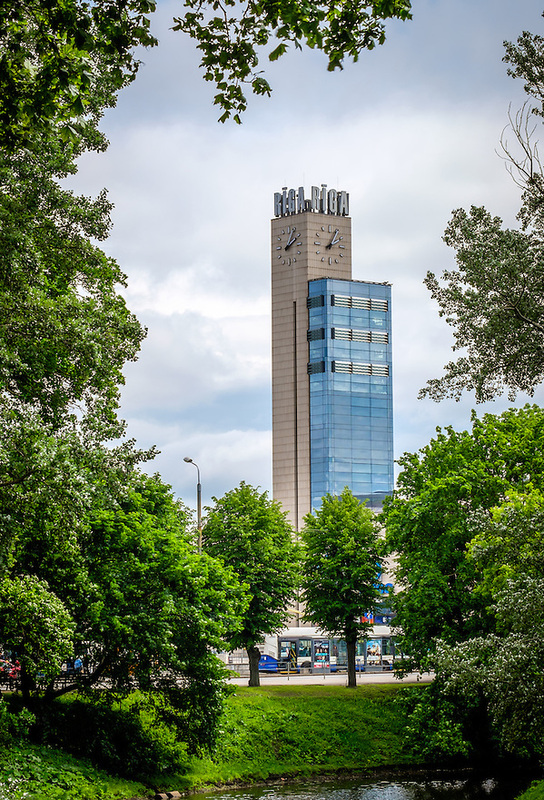 Station Square as seen from the Bastion Hill Park in Riga. 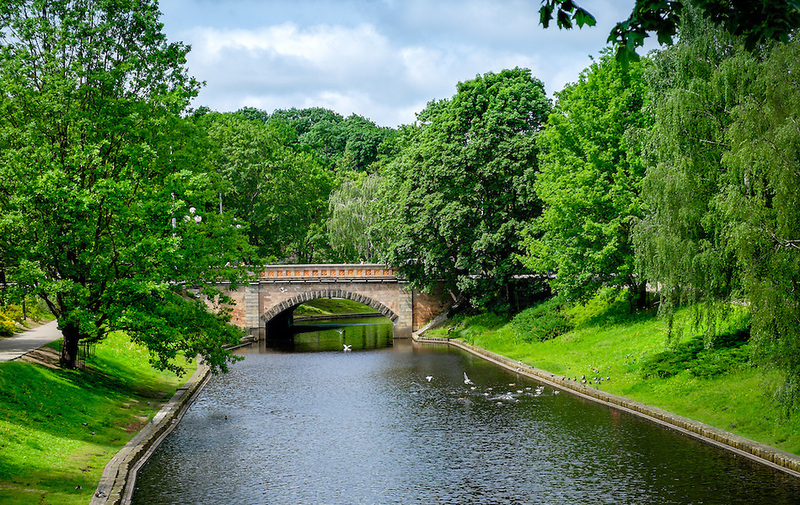 View of the city canal in Bastion Hill Park in Riga. The Apsara tea house in Riga. A trip to the central market is always a good way to spot local costumes and life; needless to say I love photographing in those places. 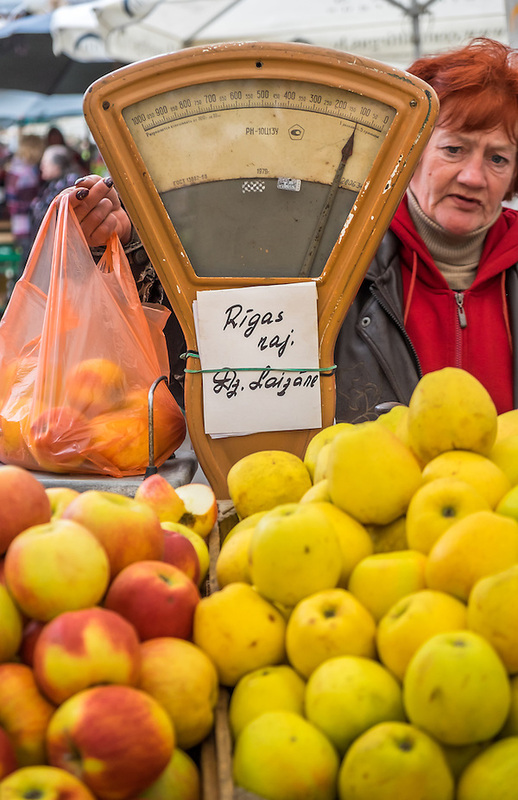 In Riga the Central Market is located just outside the Old Town, close to both the Central Bus and Rail Station. I walked around here a couple of times. 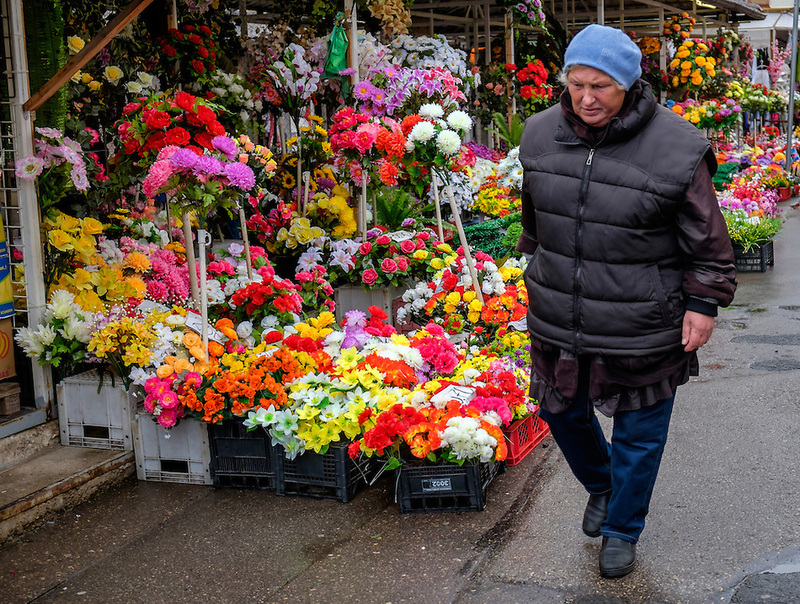 This is one of the largest and oldest markets in Europe, with five huge pavilions filled with everything you can imagine: food, clothing, flowers, etc. As if this was not enough, there are plenty of stalls in the open air around them. It was always busy there. I will probably make a specific post about the market in the coming days. 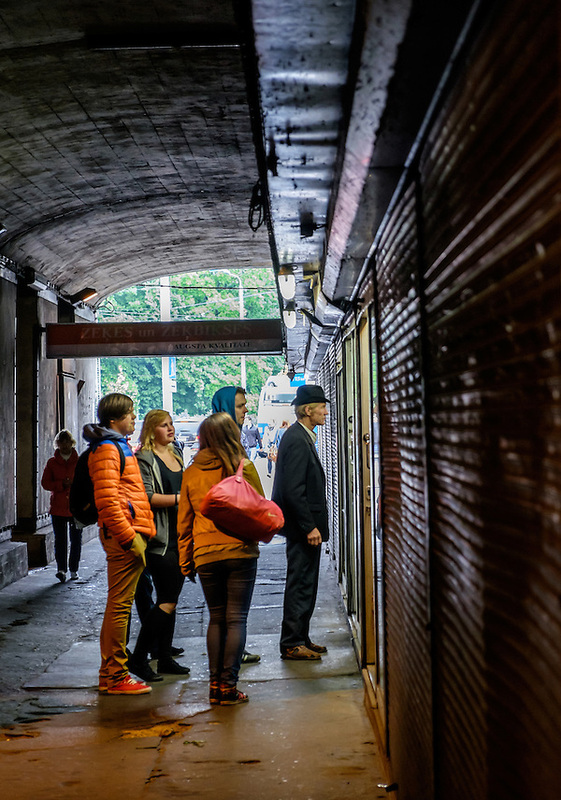 Person walking in the exterior area of the Central Market in Riga. 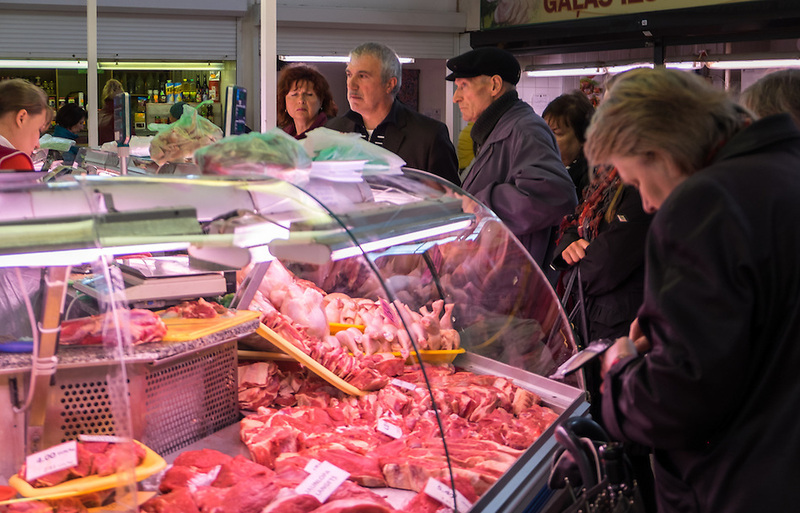 People buying in Riga Central Market. 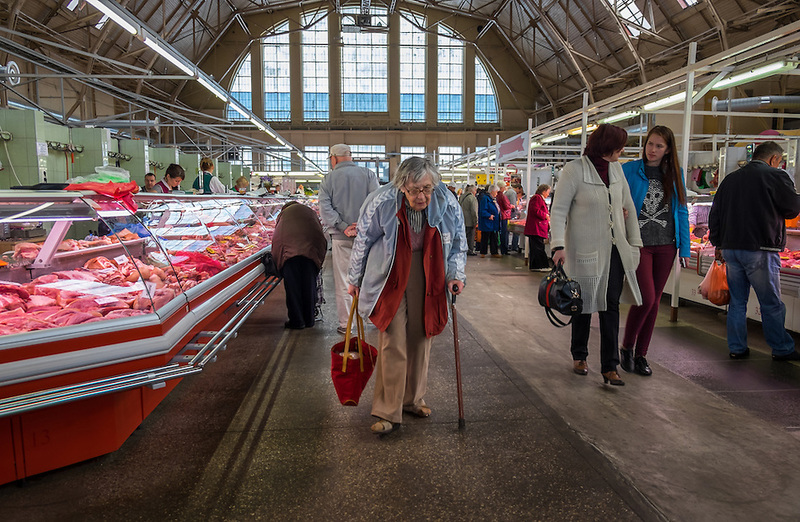 Old woman walking in Riga Central Market. 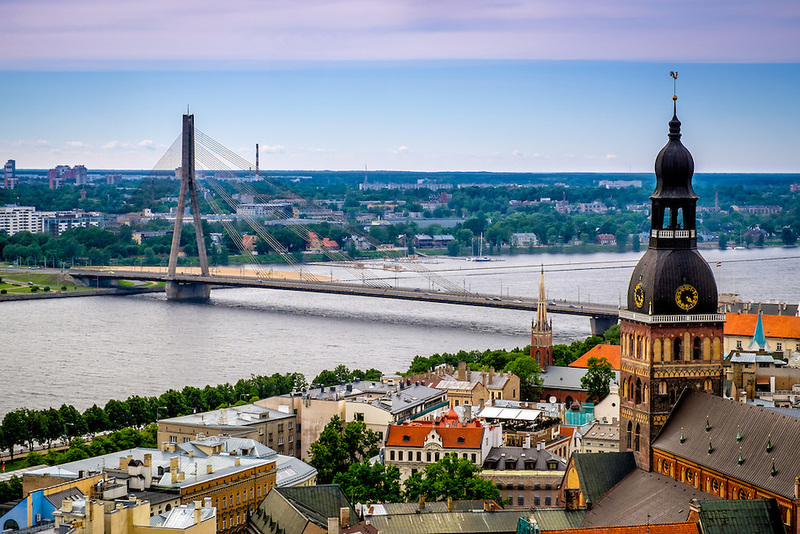 One of the best ways to see and photograph panoramic views of Riga is from the St. Peter’s Church. From here, you can peek all around town. The entrance fee allows you to visit the cathedral and there is an elevator that takes you to the top. The tower is small, but you can have a 360-degree view from the open windows. It was certainly windy the day I was there, but I stayed a while because the sight was amazing. Another great place is the Skybar in the Radisson Blue Latvija Hotel. 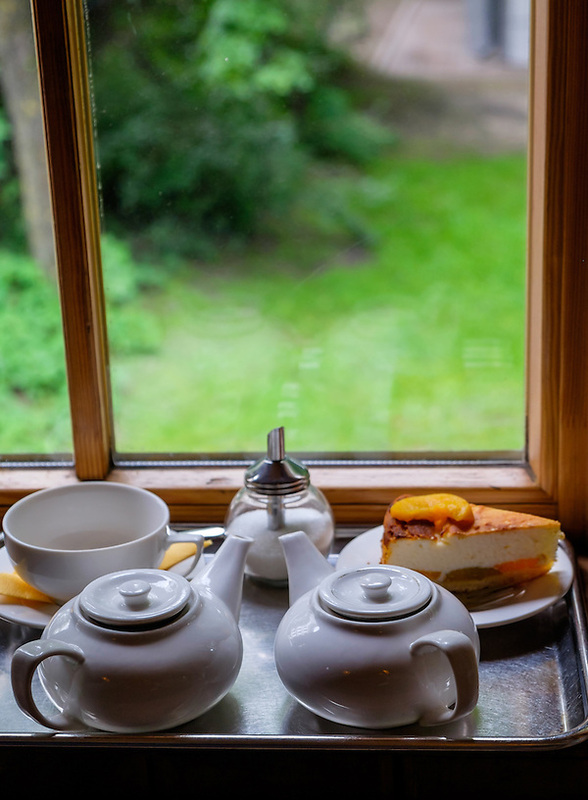 Located on the rooftop of the building, it offers great views of the city and is an amazing place to enjoy tea or drink a glass wine in the afternoon. It’s not very recommendable for photos as there is no open terrace. I returned a couple of times after dinner to Old Town Riga to take photos during twilight/night. This was somehow a painful task. During this time of the year, daylight goes from around 4 a.m. to past 11 p.m., so it was not easy to grab the tripod and go out again after a long day, but I think at the end it was well worth it. At night the city transforms itself and takes a different dimension as the majority of the buildings and monuments are meticulously lit, blending them in perfect harmony against the sky during the blue hour. 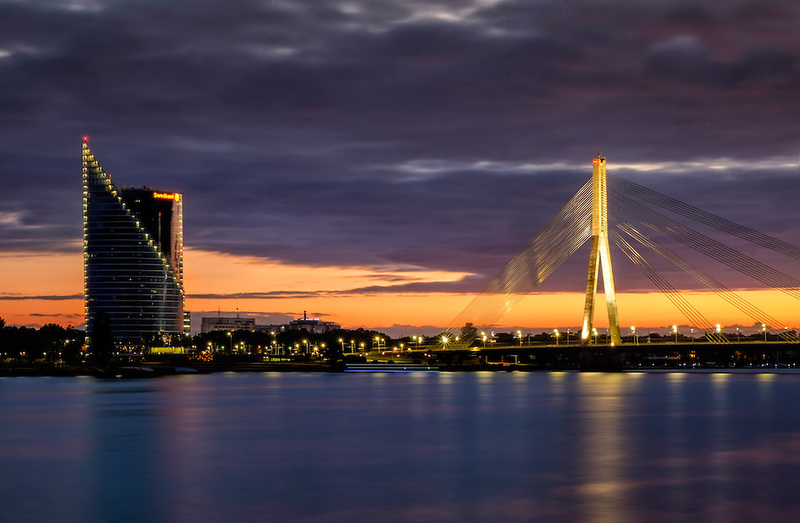 Vansu Bridge over the Daugava river at night in Riga. 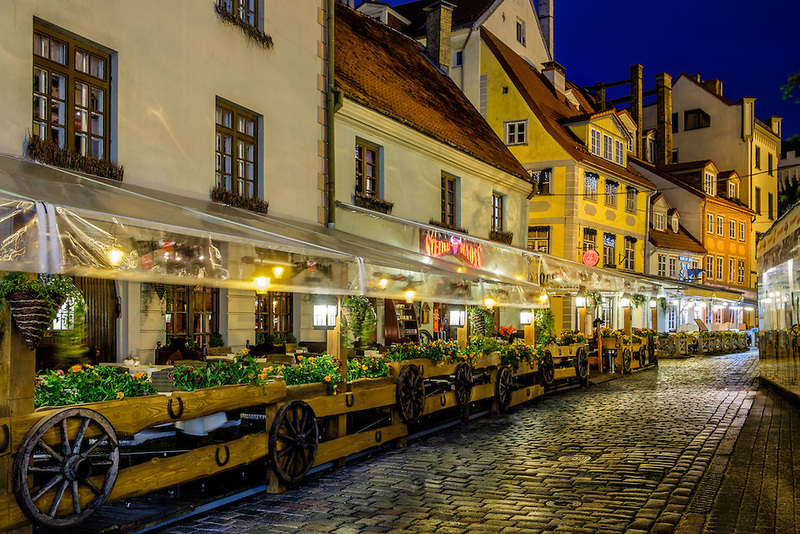 Cobblestone street in Old Town Riga at night. 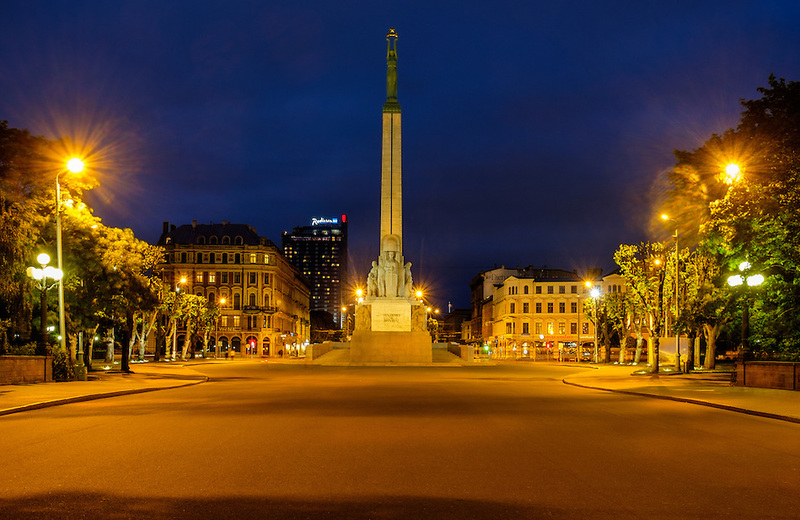 The Freedom Monument in Riga at night. 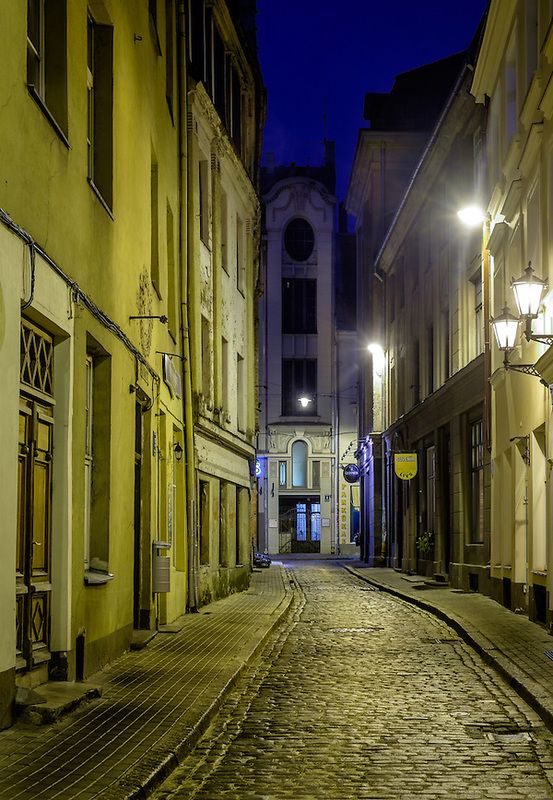 Street in Old Town Riga at night. 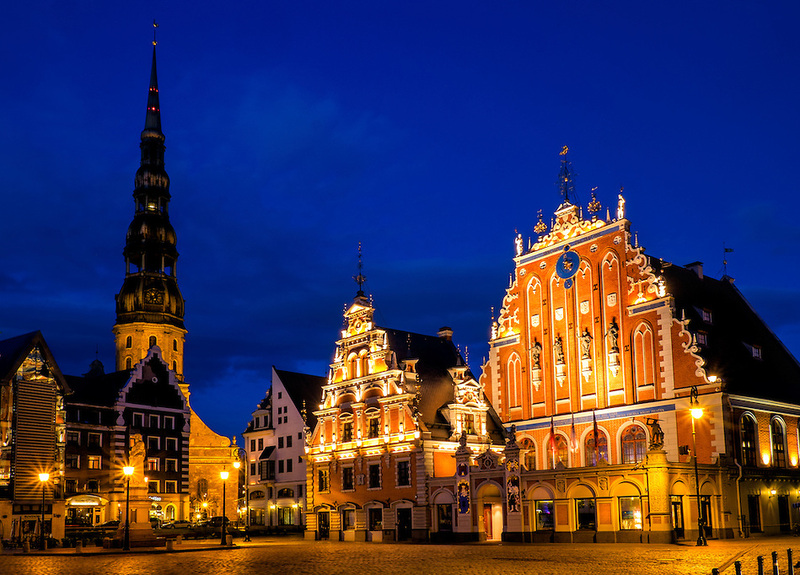 Night view of the Town Square Hall with “The House of Blackheads” and St. Peter’s Church in old town Riga at night. I really had a great time in Latvia, and I want to explore more of the Baltic region in the future. The people are amazingly warm and the food is great; its great places and rich history make it sound like a good plan to me. Hopefully it will materialize soon. As in my other recent trips, the equipment used was purely Fuji. I brought with me the Fuji X-E2 and Fuji X-T1 with several lenses, a Yongnuo flash, and a wireless trigger, all packed in a Domke F-3 that I find ideal for travel (it’s really inconspicuous and doesn’t look like a camera bag). Most of the times I was shooting with the 18-55mm in one body and the 55-200mm in the second body, which provided great flexibility and almost any focal range. Sometimes I missed a wide angle like the 10-24, which I don’t have yet but I am planning to add soon. I also had a travel tripod for night shoots. I didn’t use the fast primes as I didn’t encounter that many low-light situations.